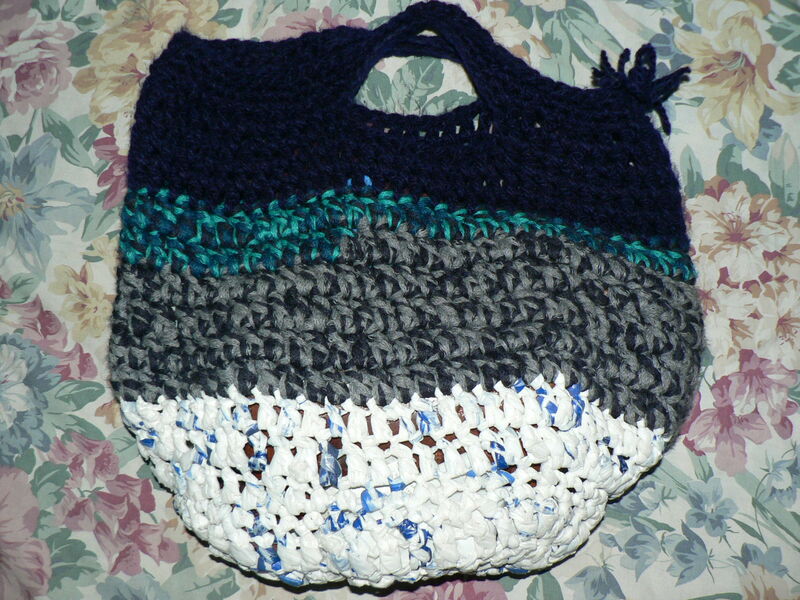 A Crocheted bag that i made… started under Rachel’s tutoring in Sandra’s house during the monkey platter festival… and finished in Pune. 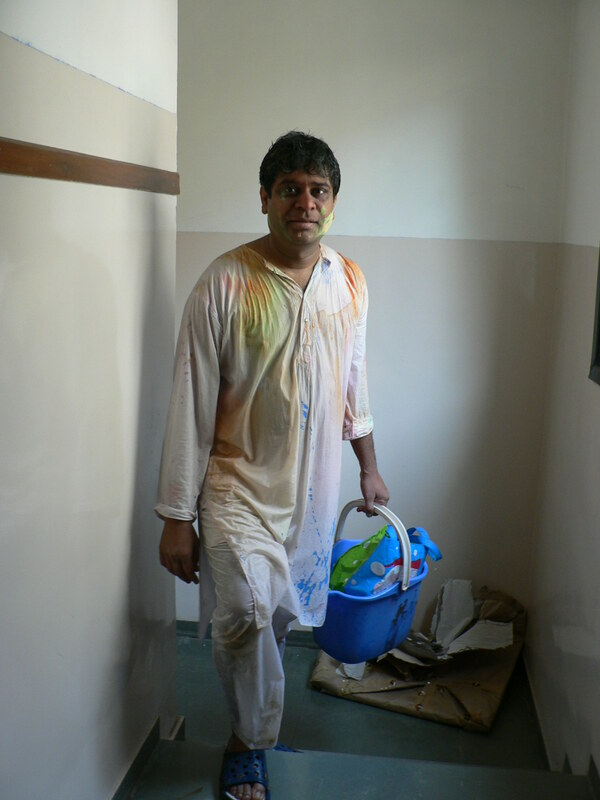 Ravi after a lovely morning of Holi festivities…. soaked, colored and in need of a shower. 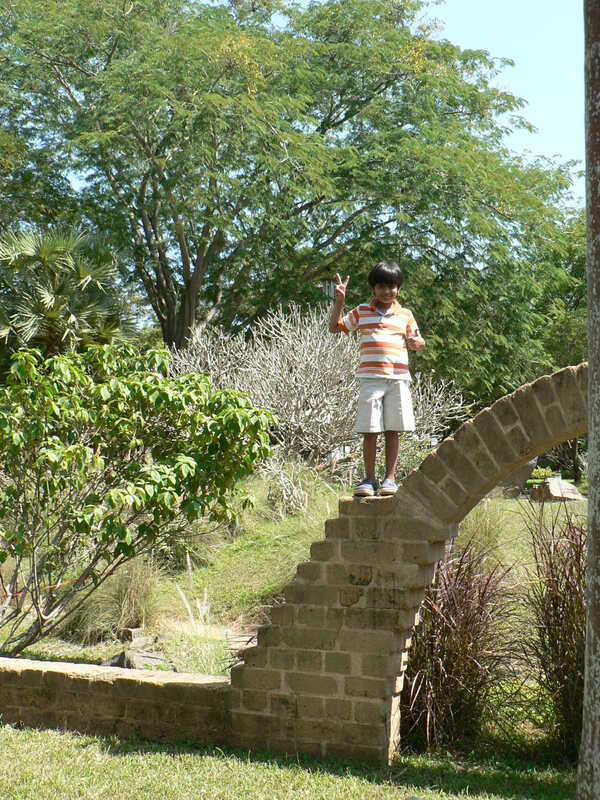 Raghu balancing on a wall in Auroville. 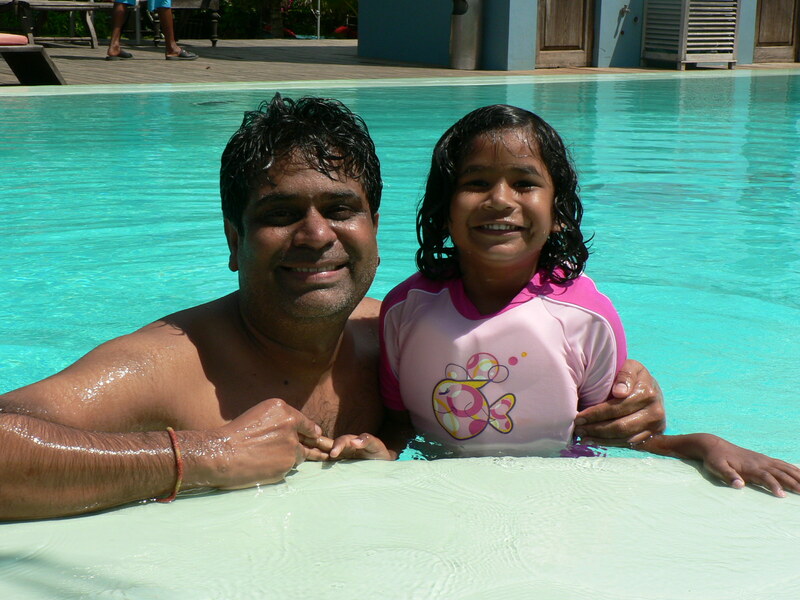 Ravi and Zoya in the pool. 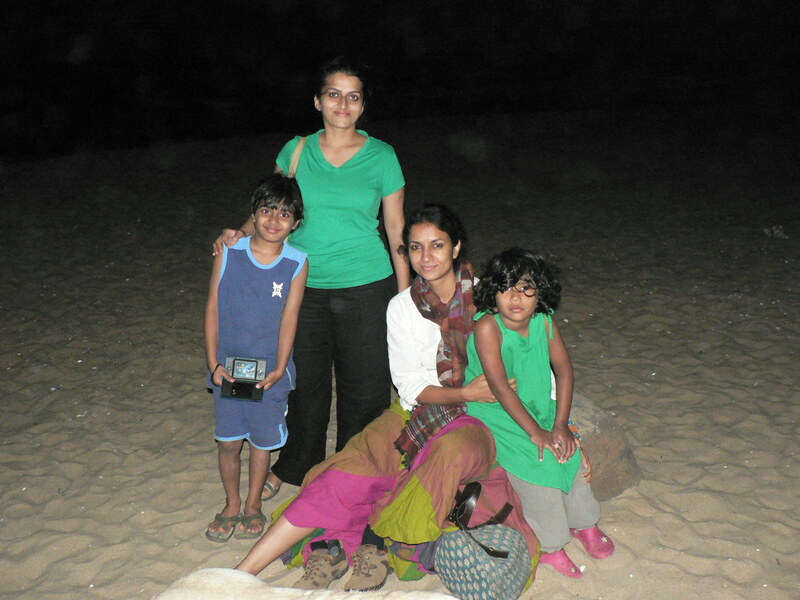 Ashwini, my dear friend who is settled in Auroville with her husband K, and us at the end of a lovely evening on the beach. 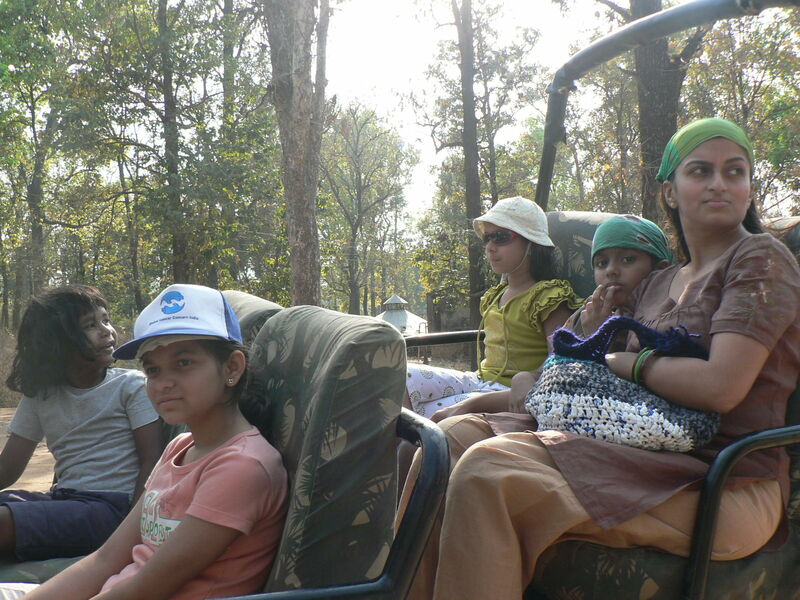 We were recently on a 5 day trip to Kanha National Park. We did not spot any tigers (the main attraction) but we did see Spotted Deer, Sambar, Common Grey Langur, a rare sighting of Leopard and Wild Dogs, Bison, Small Owl variety, Chital, Wild Boar, Sambar, Indian jungle fowl, Barasingha, Common Indian kingfisher, lots of termite and ant-hills, egrets, and others. Our trip was fun and strangely devoid of TV, and hand-helds. How and why…. I knew that the resort did not have any tv sets and they said the only entertainment was the wildlife safaris, a swimming pool, pool table, chess and other games and loads of space to walk around in. Room rates and availability dictated where we stayed. 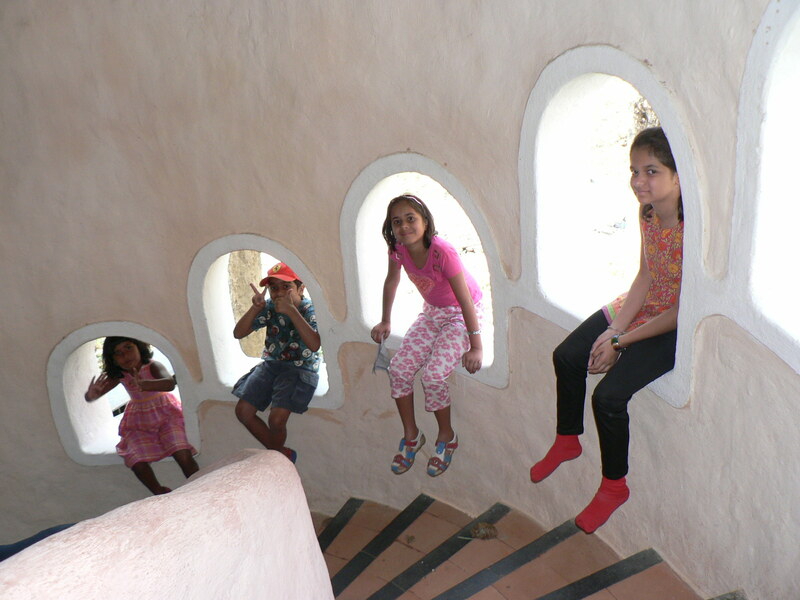 And Ravi’s sister’s family (2 adults and 2 children) joined us at the resort. And Ravi had been so busy of late that we were all looking forward to spending time with him. Further, the weather was lovely except for the middle of the day.. so the kids hung out outdoors a lot. And a Wildlife-Safari per day kept us busy for a few hours of each day. We were into our 3rd day there when i realised that no one had asked for the DS or anything else. Raghu and Zoya like these 2 girl-cousins a lot. They all played beautifully and had many conversations that i hope to record at some point. On the 5th and last day there, Raghu mentioned that we had not seen tv or played any video games the entire trip… and he seemed surprised. I was not surprised… i have noticed that whenever we have given the kids free access to green, clean areas(devoid of garbage and garbage burning and other horrendous conditions of most streets in the cities here), mild weather, friendly company and outdoor play options… they tend to pursue that a lot more than indoor activities. I wish they had access to the above listed conditions on a consistent basis… then at least they have a choice. Raghu, while seeing Litte Bear or scenes in Pride and Prejudice (i love the BBC version) of large green spaces with large shady trees etc., will get wistful and look at me. And he knows that i know what he is thinking. Sometimes he has expressed angrily that we will never be able to enjoy that…and other times he has said “it may happen for us but we’d need to plan a trip and buy tickets and do so much to get to some clean green). The scrubby, rocky landscape around Pune is dusty and dull. It is only green and fresh during and post monsoons. So i know how he feels. We were spoilt by the 4 seasons and abundant green spaces within easy access of urban regions in New Jersey. 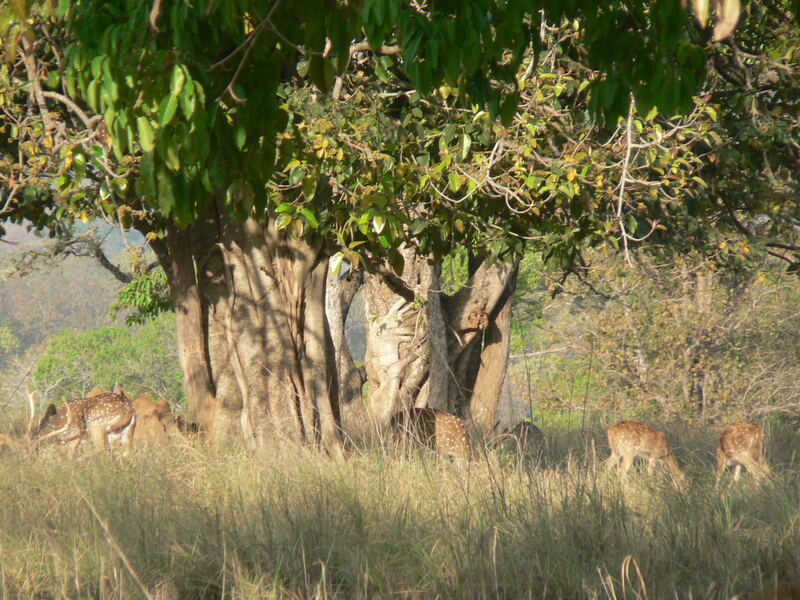 There are many natural/outdoor enthusiasts in Pune who take plenty of nature trips etc. However this is not suiting us currently because we’d only be able to go during early mornings or late evenings due to the heat… or its so far from urban areas that we find it hard to make trips just by ourselves. Its complex. So meanwhile ravi and i have budgeted for loads of little trips into greener areas in india. Having visited Kanha National Park and seeing its pristine wilderness and having some bits of Eustace Conway in my head, I’m seeing only trash everywhere. Its sad how dirty most major cities are. 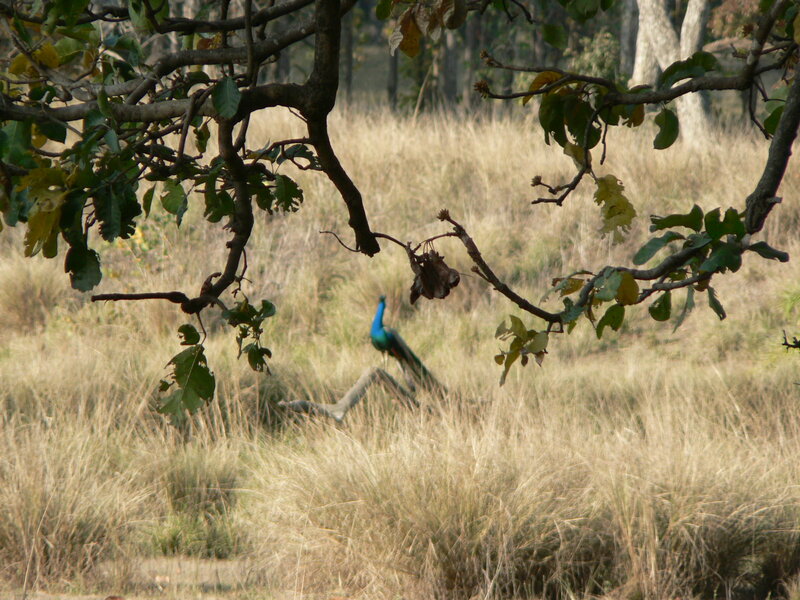 In fact as we exited Kanha we could see garbage slowly creeping into the scenery. 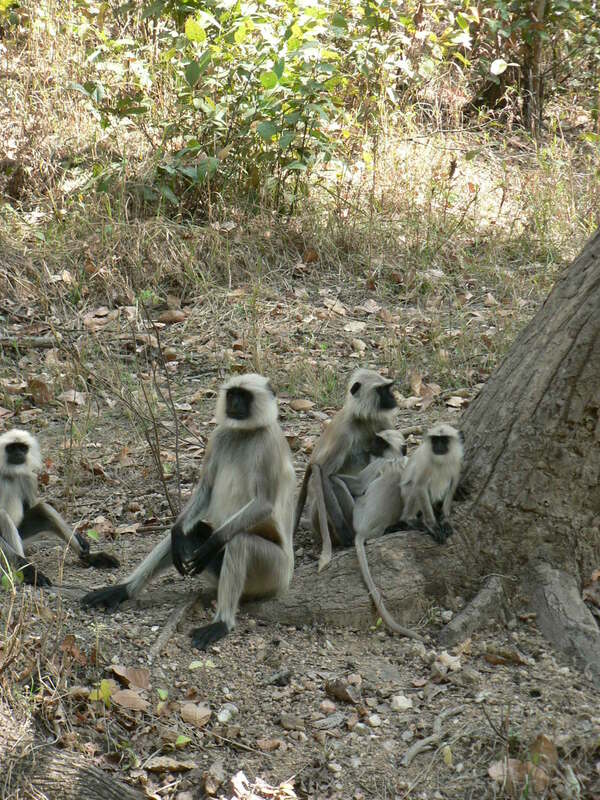 Kanha has been maintained with strict rules… no garbage stays inside the park. There is only one designated eating area. 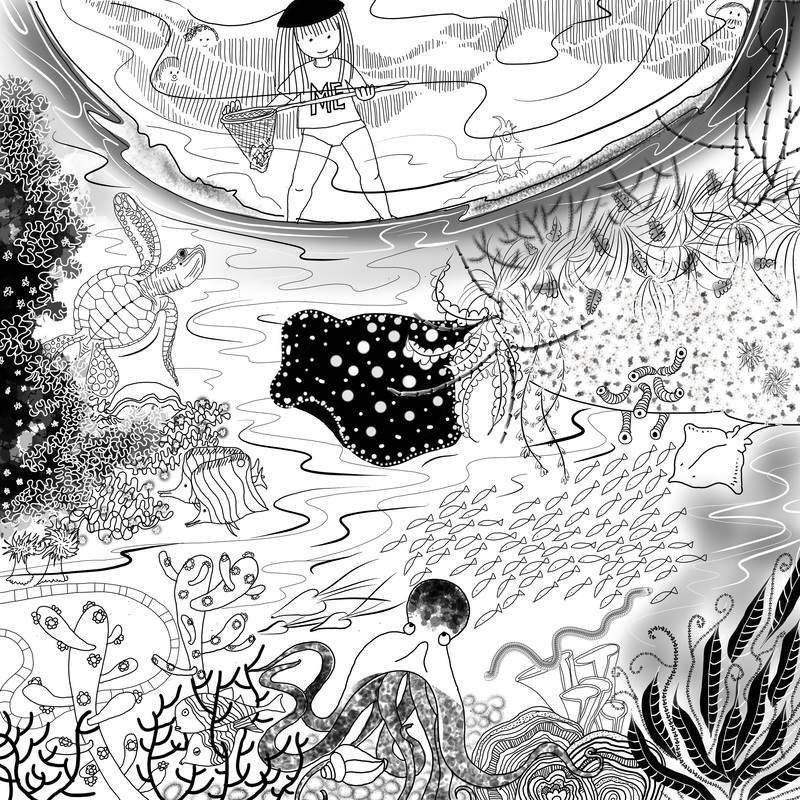 It is pristine and gorgeous. We saw so many different types of evergreens, ghost trees, scrubland, sal trees, bamboo varieties, grassland and many others. It was only after i had spent some time at the park.. that i realised what was missing… garbage! i mean… we have gotten so used to seeing garbage/rotting stuff in so many parks, play areas, cities in general etc… even when we have take rides into villages etc… there are plastic cans/bags/garbage of every sort piled everywhere….. that it was a shock to see pure composting forest floor, lovely giant piles of different types of dry leaves, etc. I am desperate for us to have regular easy access to simple beauty, countryside, clean large happy places that don’t have pollution of any kind. Raghu while lying down in a grassy patch at the Dune hotel (the pondicherry trip) said to me… he’d like to play his DS under the open sky and a shady tree.